We meet from 7:00-8:30pm on Thursday nights as posted in the Troop 2 calendar. Each month the troop goes on an outing. Typically for these we leave on Friday evening and return on Sunday. These are usually camps, adventures such as skiing, mountain biking, sailing or climbing. 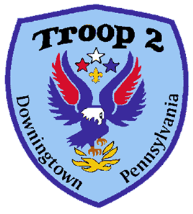 Troop 2 attends a week-long summer camp each year, typically in July t at a Boy Scout Camp. Description: The Junior Assistant Scoutmaster serves in the capacity of an Assistant Scoutmaster except where legal age and maturity are required. He must be at least 16 years old and not yet 18. He’s appointed by the Scoutmaster because of his leadership ability. By accepting the position of Junior Assistant Scoutmaster, you agree to provide service and leadership to your troop. The responsibility should be fun and rewarding. This job description outlines some of the things you are expected to do while serving in this leadership role. Comments: In many cases the JASM has the same responsibilities as an Assistant Scoutmaster. Training: You must attend the troop Junior Leader Training even if you have attended in the past. Attendance: You are expected to attend 80% of all troop meetings, Patrol Leaders’ Council meetings, outings, and service projects. If your attendance is low, or if you have three (3) unexcused absences in a row, you can be removed from office. Effort: You are expected to give this job your best effort and use the adult leadership and advice when you feel they are needed. Uniform: Set the example by wearing your uniform correctly. This means that you will wear all of the parts of the troop uniform, shirttail tucked in, with all required badges in their correct locations. Behavior: Set the example by living the Scout Oath and Law in your everyday life. Show Scout Spirit in everything you say and do. Attendance: Set the example by being an active Scout. Be on time for meetings and activities. You must call the Senior Patrol Leader or Scoutmaster if you are not going to be at a meeting or if you suddenly have to miss an outing. You also need to make sure that someone will assume your responsibilities. This requires you to “Be Prepared”, plan ahead and this will never be an issue. Performs duties as assigned by the Scoutmaster. Participate in a conference with your advisor midway through your tenure to discuss and evaluate your responsibilities and the performance of your duties. Note: You can still have a conference with your advisor at any time. If you feel like having a discussion, just ask. Provides hints and tips for the SPL and ASPL. Help SPL and ASPL as required to manage the Troop meeting. Provide help with maintaining discipline. Provide leadership in carrying out troop activities. Carry out special assignments as directed by the Scoutmaster. Support the SPL and the ASPL in their assignments. Advise other junior leaders in their responsibilities. Have fun but not at the expense of everyone. Goofing off without purpose wastes time and loses the interest and respect of the other scouts. REMEMBER: The troop will follow your example. Always conform to the Troop 2 uniform policy. Actively participate in the activities of Troop 2.